Please accurately complete the information in this application form and upload supporting documents as indicated below. All information submitted will be held in strict confidence. In submitting this application form, you are granting the “Why You?” Initiative, Inc. permission to aggregately use information collected about you for research, funding and improvement purposes. All students under 18 year old (High School Students), must have parent/guardian consent/permission to participate in [YU?]. Please download this Parent/Guardian Consent Form and upload signed form with your application and/or have your parent/guardian email or regular mail to [YU?] Headquarters Office. *NOTE: If you do not have access to an official transcript, unofficial transcripts are acceptable for this application. Please note that our admission process is very competitive, we only select those students that wants to be helped. No, Parent/Legal Guardian signature is required if volunteer is under age 18. Please download Parent/Guardian Consent Form from above and upload signed form with your application. Students and/or young professionals who need to apply for readmission include: (1) students and/or young professionals who formally withdrew from [YU?] and were absent for one or more semesters; (2)students and/or young professionals who were put on the inactive list for not adhering to [YU?] expectations and policies. Readmission is not guaranteed, and the decision ultimately rests with your mentor(s) and admission staff. Note: The process of readmission may take up to four weeks after you submit all required documentation. The “Why You?” Initiative, Inc., (“[YU? 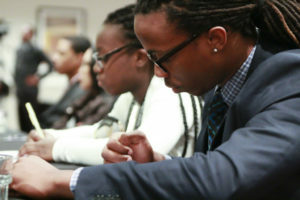 ]”) is a nonprofit entity that strives to meet the needs of students and young professionals throughout their academic and professional endeavor via programs such as our High School Students Program, Post-High School Individuals Program, Undergraduate Students Program, Graduate & Professional School Students Program, Young Professionals Program and others. The services it has or will provide include, but are not limited to comprehensive mentoring, academic, social, emotional, and professional support and academic/professional development, scholarship/fellowship assistance, assessment of skills and etc. Although [YU?] staff and volunteers work diligently to ensure the best possible service to students and young professionals, there are some natural limitations upon the services it may provide. [YU?] cannot and does not guarantee that a student and/or young professional who takes advantage of its services will earn any money (i.e. scholarships), obtain employment or acceptance into an institution/university/school using the techniques, ideas, or advice provided by [YU? ], its staff, or its volunteers. No statement rendered or materials provided by [YU?] are to be interpreted as a promise or guarantee of earnings, income, scholarships/fellowships, institution/university/school acceptance, job placement, or mentor/instructor/tutor assignment. While our intent is to assist you to the best of our ability, the success of any individual student and/or young professional, including obtaining scholarships, income, institution/university/school acceptance or employment, depends on the many factors beyond the control of [YU?]. These factors include, but are not limited to, the time devoted by the student and/or young professional to the pursuit of his or her goals; the student and/or young professional previous academic and/or professional records; the availability of scholarships/fellowships; the economic conditions of the market in which the student and/or young professional seeks employment; the interpersonal skills of the student and/or young professional; and the ability of the student and/or young professional to develop job or related skills. These factors and others differ from individual to individual. Thus, [YU?] cannot guarantee that any particular student and/or young professional will achieve results similar to any other student and/or young professional. In addition to mentor and instructor/tutor placement, under certain circumstances [YU?] may assist with the placement of a student and/or young professional with an institution or employer. In the course of this process will undertake all reasonable due diligence to ensure appropriate placement; however, [YU?] does not maintain or exercise any control over the actions of any particular mentor, instructor/tutor, institution or employer. Accordingly, [YU?] explicitly disclaims liability for the actions of said instructor/tutor, mentor, institution or employer. UNLESS OTHERWISE PROHIBITED BY LAW, [YU?] DISCLAIMS ALL EXPRESS AND IMPLIED WARRANTIES, GUARANTEES, AND PROMISES RELATED TO ANY SERVICE OR PRODUCT IT PROVIDES, INCLUDING WARRANTIES OF MERCHANTABILITY, FITNESS FOR A PARTICULAR PURPOSE, OR NON-INFRINGEMENT WITH RESPECT TO ITS SERVICES OR WEBSITE, OR THE FUNCTIONALITY, PERFORMANCE OR RESULTS OF USE OF ITS SERVICES OR ITS WEBSITE. I am of legal age and am freely signing this agreement. I have read this form and understand that by signing this form, I am giving up legal rights and remedies.